Clear, clean swimming pool water is every pool owner’s hope and expectation. Filter cleaning is an important factor in keeping water clear, safe, and usable. For cartridge and diatomaceous earth (DE) filters, this bit of recurring maintenance should be accomplished at least twice per year. 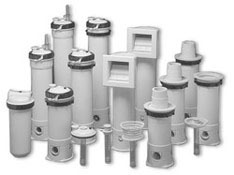 Our technicians take apart your filter completely, removing the cartridges or grids and other functional components. We clean each with a pressure washer, then reassemble and take whatever steps are necessary to begin circulation. During the process, our keenly observant technicians look for any problems that would result in poor filtration and address those with the pool owner. If you have a sand filter that is not able to filter the water properly, it may be time to change the sand completely. Our trained technicians can remove the old sand, dispose of it, check the internal components of your filter, and install new sand. Regardless of the type of filter, our technicians are prepared with many components that may need to be replaced over time. They also check out your entire equipment set and your pool for any existing or potential problems. If your water clarity issue may be chemical in nature, we can check your pool chemistry and make recommendations based on what we find. Contact or call us today to schedule a filter clean for cartridge and DE filters or a consultation for options regarding sand filters. On average, you should run the pool filter 2-3 times per day. Typically, such systems are automatic, meaning at scheduled times throughout the day, the filter will automatically turn on and run through its cycle. As for cleaning, it all depends on use. Generally, every one to four weeks is the recommended cleaning schedule for residential pools. Again, this depends on how often you swim and clean everything. A pool filter utilizes a filter cartridge to keep your pool efficient and clean. Generally, a high-quality pool cartridge will operate for 2,000 hours, based on manufacturer specifications. By this math, your filter should be changed once every 1-2 years. It depends on how often you use your swimming pool, your cleaning and maintenance schedule, and other factors.